Password Cracking Series, We will be posting online and offline Password cracking series, Now with some basic to understand. In General way Password cracking is art and science. I promise to give you my knowledge. 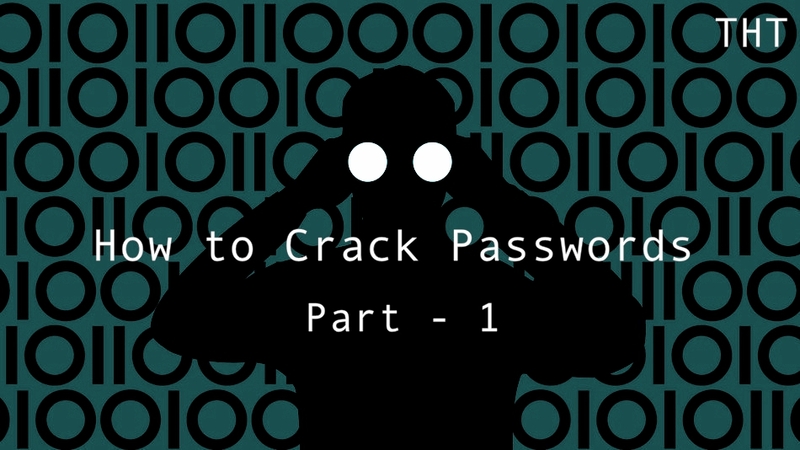 Now we are here with the Part – 1 of Hack Today Series of Password Cracking, I will try to cover my best for newbie and pro series, if you wanna suggest something or things to be included here on Part – 2 you can comment below to share you knowledge. I will show you how to use Password Cracking art and principles and technologies that is very effective to crack and capture many kinds of passwords. How to Crack Passwords, Things you need to Remember! Please Promise to do for Ethical Purpose not to Harm your Friends and Innocents. I will not be Responsible for any kind of damage. To know the Basic of Password Cracking you should first know about How many types of Password Cracking is? Password Cracking is a function of brute force computing power. It works on your Computing and Calculation speed of Password Analyzing and Cracking purpose. If your Computer can crack Each Password in a Single day Imagine If you have two computers with different Network and different hardware if that work together to crack single password that will took half day & half time to crack your password. Imagine what if you do with millions of computers and try to crack on equal password that will make your cracking with super power speed. Let’s get back to Past years, There are many kinds of hardware in Markets which you buy for many different things but there are specially Devices or Gadgets made for Specific Purpose like Password cracking which can crack passwords faster then many CPUs Working Symmetrically. GPU Stands for Graphical Processing Units, These Devices are for Improving your Gaming Interface but in Blackhat work Hackers use these to speed up their Cracking. These devices can be really powerful for cracking purpose and faster then CPU. Respberry Pi is a tiny computer that can be Really helpful to hackers and for Cracking purpose you can use these devices for making your cracking faster like a botnet dose, Respberry is an latest technology you can boot linux or Kali Linux inside Respberry pi for using tools and for many purpose. John the Ripper :- is the world best password cracking and well known tool. It comes in both command line and GUI interface, but it also and fastest cracking tool still. Ophcrack :- is a free software for cracking purpose, it comes with windows version but can be used in Linux & Mac hardware. It is still the Most Popular passwords cracking software. L0phtCrack :- kind like to Ophcrack that attempts to crack Windows passwords from hashes in SAM file or AD ” Active Directory ” it uses dictionary and brute force to attack. THC-Hydra :- is the most used online cracking tool which comes in GUI & Command line version for Windows,Linux and Mac. Hydra is capable of cracking online web passwords and it is the most powerful and effective tool made yet. nearly every type of online password can be authentication mechanism. Aircrack-ng :- if you talk about Wireless Password Cracking Aircrack-ng is the best online tool for both WPA/WPA2 Passwords cracking. It not just crack password it has more cool features. Brutus :- Brutus is online password cracking tool kind of Hydra which comes in both windows and linux version which support for cracking HTTP, POP3, FTP, SMB, Telnet and many other attacks lke IMAP, NNTP Many more. Hastcat :- Worlds fastest WPA cracker with dictionary mutation engine. Support to crack many Algorithms. Click here to Read more Features! How to Crack Passwords – Thanks for Reading! Wait for more Parts Thank you!